Life in Rio de Janeiro is all about being outdoors. With 100 kilometers of beach, spending your free hours in the hot sand is one of the favorite activities of a local. But when the night falls, and the beaches empty, the carioca likes to hang around on the street and drink some beers with friends to finish the day. Music, beer and friends, that’s how we love it. 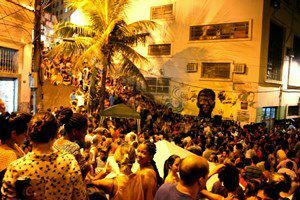 It’s no surprise that street parties in Rio de Janeiro are an important part of daily life. So, when in Rio, do as the cariocas. But where should you go? Where are all these famous crowds? It all depends on the day. 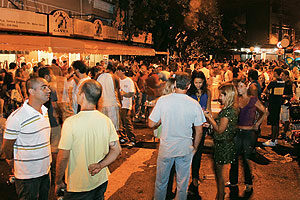 Probably the most well-known street party is Pedra do Sal (rock of salt). On Monday and Friday from around nine at night there is a live samba band playing, under the shadow of one of the oldest neighborhoods in Morro da Conçeição. The location is historically known as small Africa, on the north side of the old city center, and the party is taking place on a huge flat rock. The entrance, like to all street parties, is free. On Tuesday you should visit Canastra Bar in Ipanema. A small French bar turned into one of the most popular places in the famous district. Four years ago it was a small exclusive bar, but now it’s booming and they just expanded. If you come early you can enjoy some nice wines and French cheese. 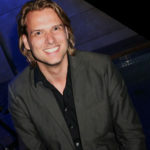 No music there, but lots of – good looking – people and a great vibe to start an unexpected night out in Rio. It almost feels like a carnival party, but then without the masks and dresses. Wednesday is a day that cuts the week in half and should be taken as a day of rest. But on Thursday a fan favorite is Pavão Azul. 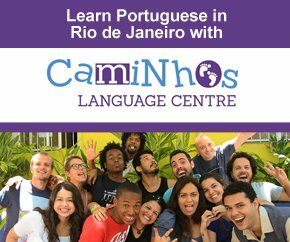 Located in the heart of Copacabana, on the corner of Rua Barata Ribeiro and Rua Hilario de Gouveia, it’s a great place to meet up with the locals. Drink the standard Original beer, combined with a traditional pastel with meat or cheese. The so-called bolinho de bacalhau is a must, they call it pataniscas. To top it off, there is the delicious batida de coco, a sweet alcoholic drink with vodka, coconut and condensed milk. Another option is the neighborhood Baixo Gávea map where hundreds of students of the nearby university PUC meet up at Praça Santos Dumont, normally with music. Saturday and Sunday belong to the alternative Praça São Salvador map, located in the Laranjeiras area. Saturday in the evening there is some nice samba and the bars all around the corner give you an alternative if the need to snack kicks in. 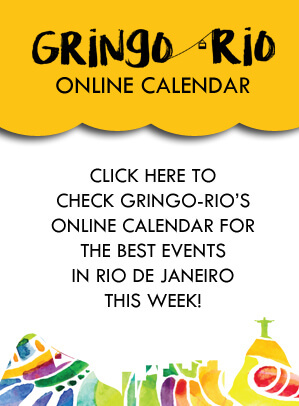 Be there around nine and you’ll find yourself in one of the most typical places of Rio you can find. On Sunday the square turns into a big market place with live music accompanying the scene. Make sure to arrive around eleven in the morning to enjoy the atmosphere to the fullest, while picking up a late breakfast or an early lunch. But remember, street parties all depend on the weather. Because one drop of rain and the cariocas will hide in their houses behind their soap opera or Netflix, only to come out until the rain has stopped. Rain means no street party. Luckily the city has mostly sunny and warm days, so the chance to miss out on one of the street parties in Rio de Janeiro is almost impossible.